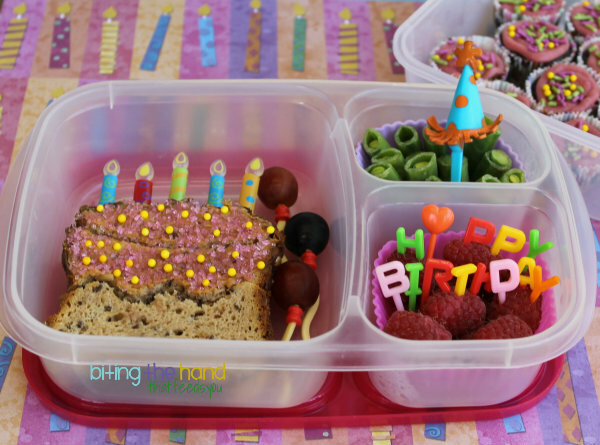 Biting The Hand That Feeds You: Happy 5th Birthday Bento and Classroom Snacks! 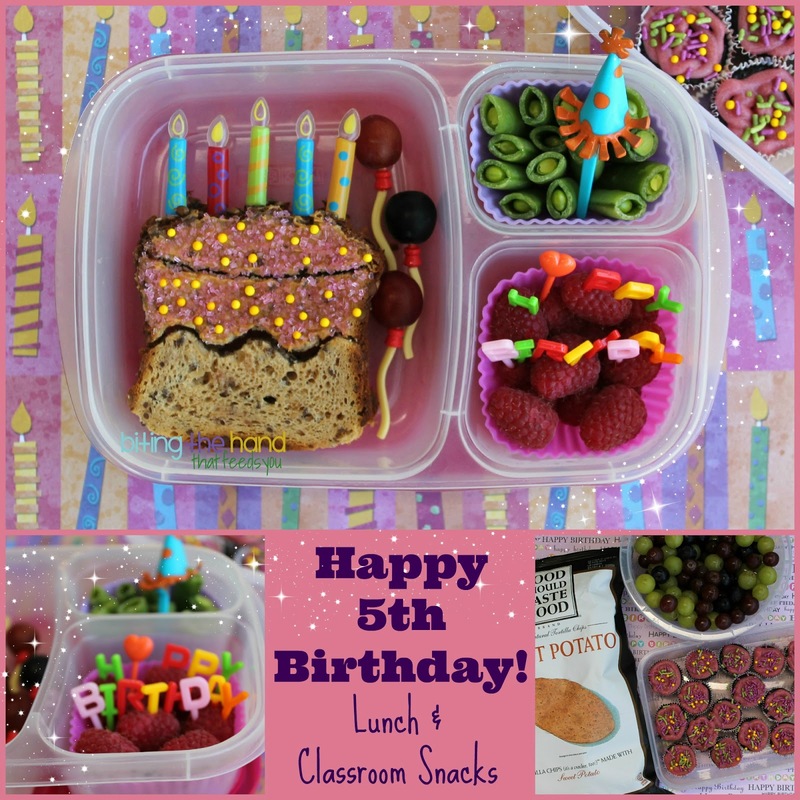 Happy 5th Birthday Bento and Classroom Snacks! Friday was my big girl's 5th birthday! 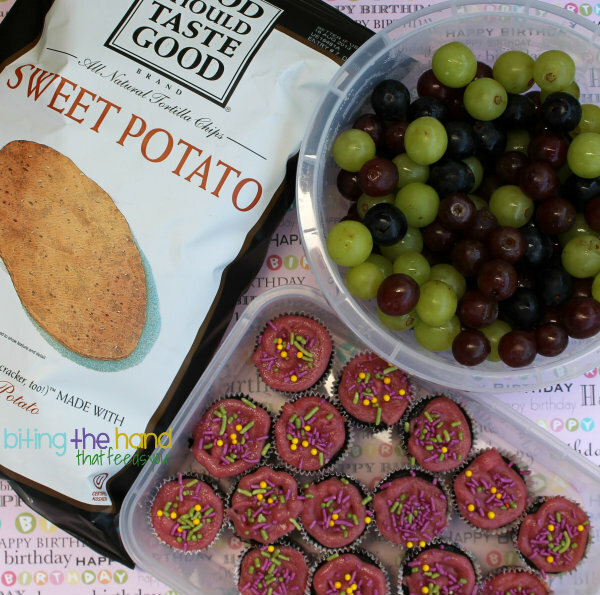 But there's no school for us on Fridays, so I made her a special birthday lunch for school the day before, along with mini cupcakes and classroom snacks. For fun, I popped a few grapes on some balloon string picks (this is one of my favorite pick sets out there!) I was very pleased with myself, since I rarely get to make "balloons," as she hates cherry tomatoes and I don't often have grapes lying around. Well. Apparently she thought the darker grape was an olive and was peeved to discover it wasn't, so refused to eat the rest! But now I know I can make balloons any time I want... as long as they can be black! For some reason one of my "As" was missing, so I improvised with a heart-shaped pick. That'll do pig, that'll do. 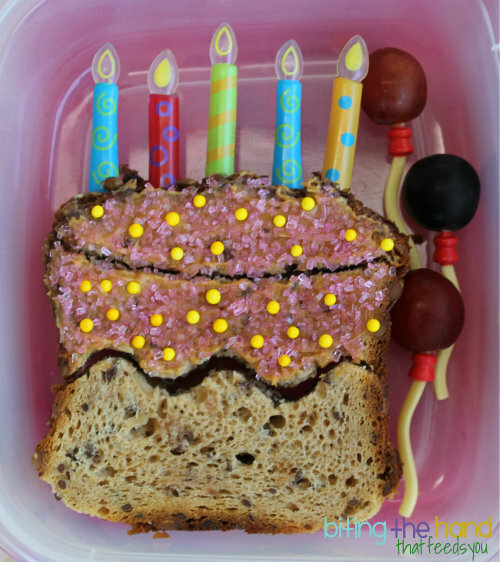 I spread a little peanut butter on the "frosting" section of the top slice of bread and added some India Tree Nature's Colors Pink Sanding Sugar and Yellow Non-Pareils sprinkles to make it look more cake-y. To my amazement, that was the part of her lunch she didn't eat! Whaaaaa? I had originally intended to send a bag of sliced organic apples, but I had a container of freshly washed grapes that forgot to get sent the day before (doh!) so I sent those instead. The Food Should Taste Good Sweet Potato Tortilla Chips were a last-moment addition, since I had a bag laying around and I knew she liked them, since she'd scarfed down a small individual-serving-size bag the night before that I'd gotten in a swag bag. The school requests cans of frozen juice concentrate, but we mostly shop at Trader Joe's and a local natural market, and neither of them carry a huge selection (they pretty much just offer OJ.) So I've just been buying large bottles of Z's favorite Trader Joe's juice flavors for our snack days. For this week we chose organic pink and yellow lemonades, pomegranate limeaid (her favorite!) and as a special birthday treat, sparkling pink lemonade for the last day. Baby Cakes: For the cupcakes, I used a Wholesome Chow chocolate cake mix - made in a nut and gluten-free facility, organic, fair trade chocolate, vegan (egg and dairy free,) and non-GMO. So, all kinds of wonderful! I found mine cheap at Home Goods, but they're hit and miss on what they have at any given time. The nut-free facility was important to me because there's a student in her AM preschool with a peanut allergy (non-contact, which is why she can have PB in her lunch.) And both Z and another child there avoid gluten. It's a long story, and I know people feel uncomfortable talking about it, but I'm working on reducing our intake of animal products, so I was excited that these could be egg and dairy free as well, with zero extra effort on my part! And don't even get me started on GMOs! Instead of dairy milk, I used So Delicious unsweetened coconut milk, since coconut is already a little sweet, and doesn't have a chalky after-taste like soy can. The only substitution I made was to use beet puree instead of oil, since I've had good luck subbing with fruit-veggie purees in the past. Well. 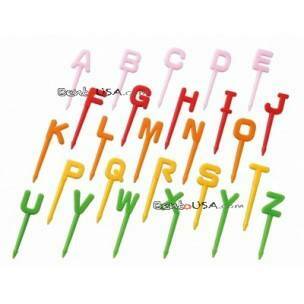 I messed it up somehow, since these felt like pudding in your mouth. Baked pudding. Very strange. Luckily, slap enough frosting and sprinkles on, and the kids won't care! Since I'm lazy, I had a tub of Cherrybrook Kitchen's pre-made frosting sitting in the cupboard, just in case. It's all-natural (no fake colors or flavors, unlike -every- brand in the supermarket) and also nut, gluten, egg, and dairy free (and vegan.) I was glad I had grabbed one last time we were at Whole Foods, since I was not looking forward to having to make up a batch of frosting on my own! I had been aiming for pink, but I guess I overestimated the amount of red India Tree Nature's Colors natural food color that would be needed. I tried adding blue to make it more purple, but my bottles were so old that it had turned greenish, and didn't make much of a difference anyway. 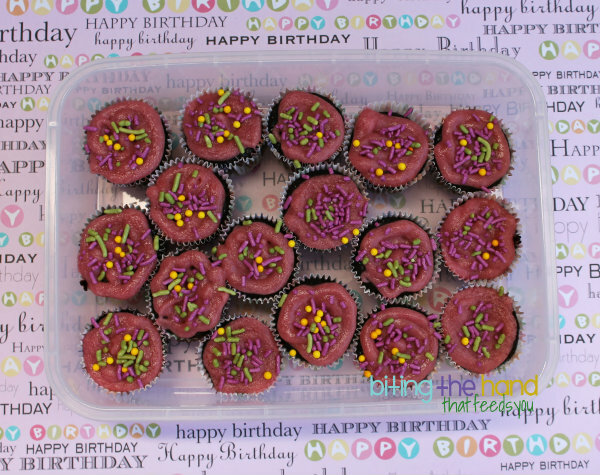 To "pipe" it onto the mini cupcakes, I just used a Ziploc bag and snipped off a small bit of corner to make a hole. I mixed together some India Tree Naturals yellow non-pareils, purple jimmies, and green jimmies sprinkles, and dispersed them on top. And after destroying some trying to get them out of the pan (spilled batter meant that the wrappers were stuck, and the cake stuck to the wrappers, so when the wrappers ripped or got pulled because they were stuck to the side, they got decimated,) I had *exactly* enough for the kids in both classes. And only if I included the few funny-looking ones that were half-ripped. Frosting and sprinkles heal all wounds!